The vibe when you enter New Times is beautiful. You are greeted by murals lathered over each wall and “tale telling” tiles. The ceiling, the walls and even the floor have all been thought about and decorated impeccably. There’s a certain ambience about the place that you can feel in an instant. The owner, Ali, is Moroccan and he’s done a good job in transferring the Moroccan aura. As you would imagine, it’s a very peaceful, relaxed, easy-going environment where you can sit and daydream or socialise for hours. 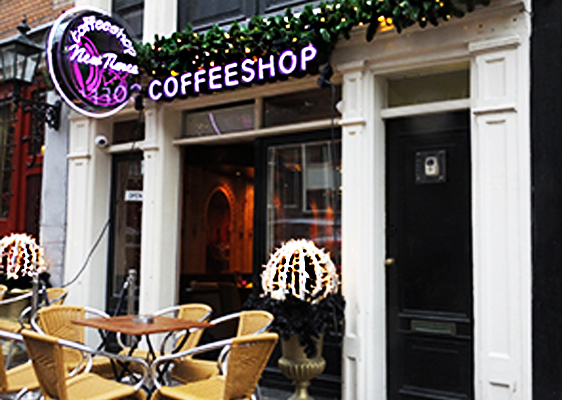 Amsterdam can be a very crowded city full of hustle and bustle, if you need to get away from it all, enjoy the smoke and have a breather – Coffeeshop New Times is the place to head! A little bit of extra good news about New Times – great value for money as far as the cannabis menu is concerned. You can buy from a minimum of 1 gram to a maximum of 5, but if you opt for the 5, you’ll get a bit of a discount, and the same with the space cakes. For example, 1 gram of Amnesia Haze is €10, buy 5 grams and you’ll get that for €45! €5 discount, who doesn’t love a bargain! Give it a go!